When I first heard about the possibility of an ISTE Leadership Forum, I was thrilled about the prospects of a conference that would allow me to collaborate with school leaders and share solutions to the most pressing issues we are facing in our schools today. As the October event draws closer my excitement continues to grow because I know this event will leave me with a wealth of concrete ideas to bring back home to my district. In addition, I know that the connections that I make with colleagues from around the country will allow me to grow my Personal Learning Network (PLN) and have an expanded list of educational experts to reach out to as new challenges arise. Maximize your tech investment and stretch your dollars. Leverage social media for instruction and establish a social media policy. Employ technology to meet the Common Core. Support and motivate your staff to embrace new strategies. Engage tech tools to assist with parent communication and involvement. First off, Chris Lehmann is the opening keynote and having the chance to sit down with Chris and hear his thoughts is an amazing opportunity in itself. But more importantly, Chris and the other ed. leaders who will be there (i.e. George Couros, Sheryl Nussbaum-Beach, and many others) are accessible every day of the week through their blogs, twitter accounts, e-mail, etc. Michael Fullan is one of the most highly-regarded change leaders in the world when it comes to the field of education. I had the chance to spend a full-day workshop with him over 10-years ago, shortly after the release of his book Leading In A Culture Of Change and it is still among the top Professional Development experiences of my career. More recently, Fullan has published Change Leader, another great resource for educators to rethink the traditional model of schooling that is holding back our staff and students. A few years ago the National Council of Teachers of English created a new 21st Century Literacy Framework. The truth of the matter is that what it means to be literate in 2012 has changed a great deal from when many educators were in school themselves. In order for us to truly fulfill our role as instructional leaders, we need to understand this shift and become comfortable with this new skill-set and model it for staff, students, (and our communities). Fortunately, ISTE has a set of clear standards for administrators, teachers, and students to help us in this critical work. For all of these reasons, I feel the ISTE Leadership Forum will be my most important Professional Development this year. I will have the opportunity to continue to expand my vision and goals for myself and my school and ensure that we are on the right track in providing our students with the most relevant educational experience possible. 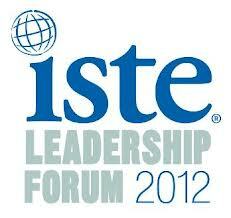 Thank you ISTE for making this event a reality! Please spread the word to other educators in leadership positions. This is something that they will be sorry they missed! Hey Forbes Magazine! What About The Students? !